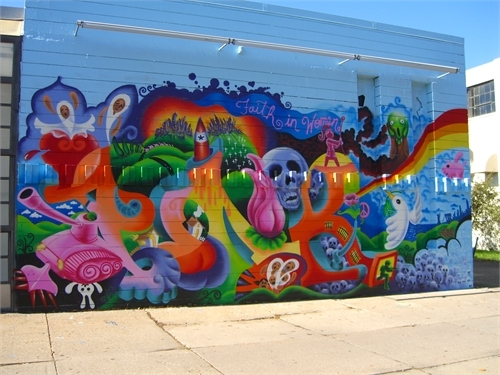 The graffiti art that we’re familiar with today was once part of a controversial art movement. It ranged from words sprayed or written to elaborate paintings on walls or subways cars. Art historians and graffiti aficionados often regard Bobby Beck and “Cornbread” as the first modern-day graffiti writers. In the 1960s, they tagged city walls in Philadelphia. Eventually, graffiti spread from the City of Brotherly Love to New York City. In the 1980s, Manhattan galleries began showcasing graffiti-style work. During that period, crime was on an upswing and graffiti was sprawled over trains and walls. For New York city officials, it signified a loss of control. That’s when the Clean Train Movement began and graffiti-covered subway cars were either cleaned or replaced. For decades, there have been many other initiatives to curb graffiti. In Wipe Out Vandalism and Graffiti, the U.S. Department of Justice states, “Intentionally damaging property, public or private, is a crime. Vandalized, graffiti-marked, and messy property generates unease and says to the public that the neighborhood, school, or community is not valued by its residents” (p. 1). In America, penalties vary from state to state, but Nevada is often cited as having the strictest laws. In Singapore, graffiti carries a caning punishment, fines, and jail time. Epidemics are sensitive to the conditions and circumstances of the times and places in which they occur. For example, “zero tolerance” efforts to combat minor crimes such as fare-beating and vandalism on the New York subway led to a decline in more violent crimes city-wide. In Graffiti, Deborah Lamm Weisel writes, “Graffiti is not an isolated problem. It is often related to other crime and disorder problems” (p.3). Today graffiti is officially recognized as a form of fine art. Artist, writer, and Harvard graduate Caleb Neelon’s graffiti work can be spotted in city streets and exhibitions worldwide. Shepard Fairey’s Barack Obama “HOPE” portrait joined the ranks of other esteemed artists and is now part of the National Portrait Gallery in Washington D.C. Finally, 5-star hotel, Fairmont Quasar Istanbul proud displays its support of urban culture and contemporary art. A team of local artists recently embellished the hotel’s entrance with vibrant graffiti murals. On the fashion front, Dolce & Gabbana, Louis Vuitton, and Marc Jacobs have all used graffiti to embellish their wares—from t-shirts to handbags and sneakers. In recent decades, many destinations like Miami's Wynwood Walls and Honolulu’s Pow! Wow! festival invite artists working in these genres to splash come some color onto their walls. Miami became a major hub for graffiti. Many people still don't know it's a solid art movement and has evolved into its own culture. Artists from all over the planet have kept it alive and kept it going," says artist Erni Vales of Evlworld. Vales is best known for his development of a 3D graffiti style.